ASK FOR OUR DEMO VERSION HERE! Are you looking for a technical solution for your own crowdfunding platform? We can offer integrated solutions or build seperate platforms to suit your needs. Crowdfunding-technology is experiencing a real boom. In Germany the internet community (crowd) is becoming increasingly important in matters of creative, business and charity funding. Projects of all kinds, whether they are movies, music, books or anything else can be brought to life by crowdfunding. Our White-Label solution offers a number of different features that can be altered according to your needs. We offer our service and technical assisstance to provide you with a professional crowdfunding solution that meets your expectations and requirements. When required we also supply graphic and design conception and implementation. 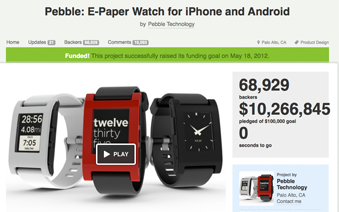 Having gathered more than 10 million U.S. dollars, the SmartWatch Pebble project on the U.S. platform Kickstarter is the most successful project in Crowdfunding history. In total, nearly 69,000 people supported this project. 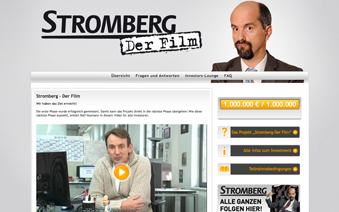 The german adaptation of the british TV Show "The office" is called " Stromberg" and is one of the most known and loved TV shows in german Television. The creators of Stromberg wanted to make a movie based on the show. They decided to use crowdfunding as a funding and marketing method and realised the project via the website myspass.de. Until now the project was Germanys most successful crowdfunding endeavor as they raised 1 million Euros in less than a week. 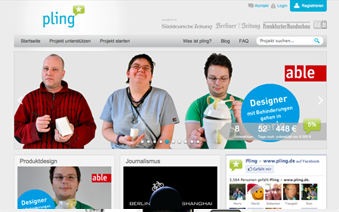 From 2010 until 2012, we operated the German Crowdfunding Plattform pling. People were able to fund creative projects. These were art, movie/video, technology, comics, community, craft, dance, comedy design, events, fashion, food, games, music, photography, journalism, theatre and writing projects. Many projects were financed with the help of the internet-community. We developed an internal crowdfunding platform for the Sparkassen-Finanzportal. We made it! Together with Sparkassen-Finanzportal we have developed the internal crowdfunding platform “Ideenfabrik” for the german bank Sparkasse. The portal was launched on the 20th of March 2013 and combines innovation management and crowdfunding in order to centralise internal financing and the coordination processes of new ideas. Together with us, Sparkasse pursues this new, exciting path. Pling* belonged to the first crowdfunding-platforms in Germany and has established itself in the creative and cultural industries as a platform for alternative project funding. Pling* had a clear, understandable navigation and page structure. Its great usability was also one of the secrets of its success. Our payment soultion, which we developed in cooperation with Pay Pal, made it possible for the money to only be transferred when a 100% total had been reached. Other payment options can be implemented as well. Projects can be created with descriptive text, images, videos and support levels. The level of support can be set individually. Projects can be shared via Facebook, Twitter, Google+, and email. Our system automatically generates a shortened bit.ly URL for each new project. Our system enables automatic e-mail notification after registration, after support, shortly before the end of a project, after the successful financing, etc. Project owners can receive feedback and comments on their individual projects by visitors on the site, supporters or other project founders. Our technical solution allows users to share private messages with each other. 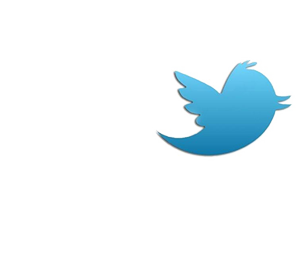 Users will be notified of new messages automatically. An excel-list – containing the usernames of supporters, email adresses and the specific funding amounts – can be exported from the backend.